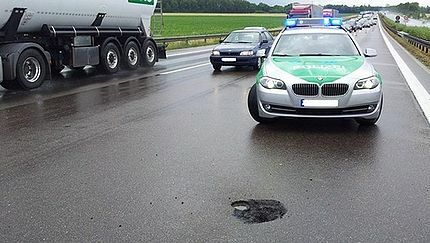 A massive lightning bolt blew a hole in a road in the German city where the legend of Frankenstein was born that was so big police had to mount an operation to seal off a lane keep motorists safe. The lightning struck near Ingolstadt in Bavaria – the place in the novel Frankenstein by Mary Shelley where the scientist Victor Frankenstein creates his monster by using lightning to bring him to life. Maria Dornbacher, 64, from the Salzkammergut region of Austria was driving through a thunderstorm in Ingolstadt in her VW Tiguan when she saw a bright flash. Her car electrics went out as the millions of volts of electricity carried in the lightning bolt destroyed the car’s controls as they passed around the outside of the vehicle. She said she had not initially realised her car had been struck by lightning despite a “huge bang”. The strike went round the car to blast the hole in the asphalt below. Other car drivers behind her who saw the bolt strike called police who found the woman inside her broken down car. They also found the 20cm deep hole. The OAP was uninjured in the incident but her car had to be towed away.